Stephen Bygrave’s visit to Sri Lanka in September was a great success. In his words, ” lots of goodwill, big hearts, open minds . Great relationships between NGOs. Government also open to input. Very few negative statements or feelings”. 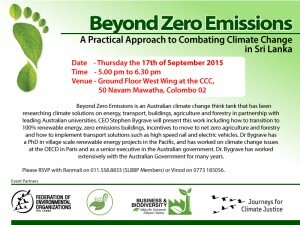 Stephen is CEO of Beyond Zero Emissions, which has demonstrated the technical feasibility of 100% renewables in Australia. Stephen also says that he learnt as much as he was able to offer, especially as Sri Lanka has committed to 100% renewables. Stephen’s expertise was welcomed in two main forums. One was an event organised by the Chamber of Commerce was attended by 67 representatives from business and agencies, such as the Climate Change Secretariat. The other was Kolomba Yathra, a youth gathering and march organised by ECO-V (see more on this below). Many youth had been on previous youth Journeys organised by ECO-V and supported by JCJ. Media Coverage was offered by the Daily Mirror Financial Times, the Ceylon Today Financial Times and the Ceylon Daily News. Thanks to Eco-Friendly Volunteers and the Federation of Environmental Organisations for facilitating Stephen’s trip. So much was achieved in just one week. JCJ’s role was to raise the funds to make it possible. We look forward to collaboration in the near future. 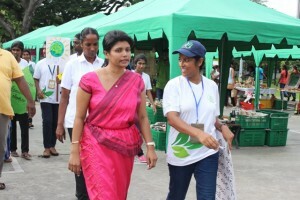 Images – Chamber of Commerce invitation to Stephen’s event; youth march; Kanchana Weerakoon founder of ECO-V and JCJ member (left) with Mrs. Chathurika Sirisena the President’s daughter; visit to temple on the march (Stephen is in the foreground with sunglasses on head). 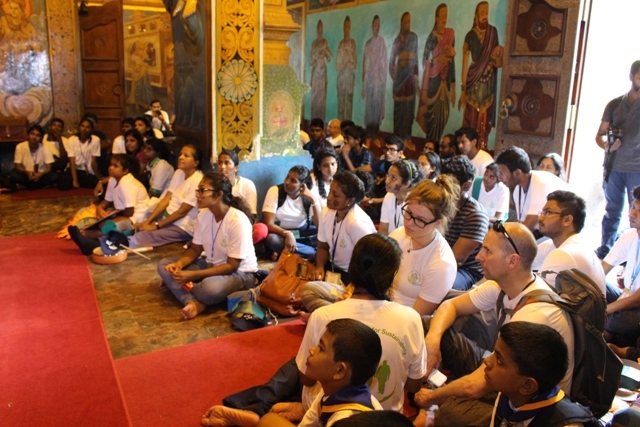 Kolamba Yathra 2015 was the 3rd Yathra (journey) conducted by Eco Friendly Volunteers (ECO-V). Its theme was interfaith journey for sustainability. Kolamba Yathra 2015 took place on 19 September 2015 with the participation of more than 200 youth from different youth groups, societies, communities’ universities and schools representing Buddhist, Hindu, Christian and Islam religions. 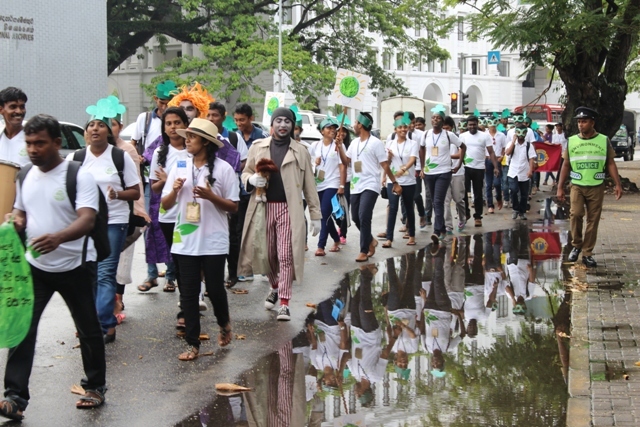 The purpose of the event was to create awareness among general public on climate change and how each individual can contribute towards the impact of climate change. Also this journey was held to raise Sri Lankan voices to support all those working very hard towards COP 21.